Today’s hospitality industry is harnessing comprehensive human capital management (HCM) solutions, are you? From seasonal hiring to complex, variable payroll needs, the hospitality industry faces several unique challenges that no other industry faces. Leading hotels and tourist destinations are achieving outstanding business results with better HCM by streamlining processes and keeping costs down. Organizations in the hospitality sphere are uniquely poised to take advantage of the tools offered by comprehensive HCM. Discover how cloud-based human capital management empowers hospitality leaders to get the job done right. What can streamlined people management offer? The hospitality and tourism industry is packed with a wide range of unique challenges. Hotels and other destinations must balance the needs of their guests and their balance sheets, all while contending with higher-than-average turnover and seasonal flux. Cloud-based human capital management (HCM) empowers these companies to get the job done right. Managers and executives in the hospitality field know that their business never sleeps—and they need comprehensive, continuously-improving solutions to keep up. HR leaders across the globe are harnessing HCM in the cloud to tackle these obstacles head-on. In this toolkit, discover how leading hotels and tourist destinations have achieved outstanding business results with better people management by streamlining processes, saving money, and supercharging productivity. With over 500 locations across 40 U.S. states, Red Roof Inn provides customers across the nation with affordable hotel accommodations without sacrificing comfort. Those 500 locations now serve millions of guests each year and employ almost 3,000 people. In the past, weak data collection and reporting systems prevented Red Roof Inn’s HR team from identifying their top performers, analyzing turnover, and improving the employee experience. Without the ability to run business-specific reports, HR missed opportunities to provide senior management with data-driven insights. Reporting problems were compounded by a system that recorded every employee transfer between Red Roof entities as a termination, undermining statistics about employee tenure and development. In addition, valuable performance evaluation data was accessible only through imprecise, manual processes. In January of 2016, Red Roof made the decision to upgrade to a unified HCM solution in order to address its business intelligence (BI) challenge. Red Roof’s view into its people is meaningful to the company at a corporate and individual level. For the first time, the company has insight into its employees’ work and compensation history, as well as the ability to track employee education, career interests, awards, certifications, and training. These new insights have positioned Red Roof’s HR as a key contributor to business strategy and have enhanced relationships between HR and the company’s senior leadership. Since implementing the new HCM solution, Fisher has been able to use turnover report details that include numbers, positions, and reasons to understand why turnover may be unexpectedly high in certain areas. Fisher reports that several department leaders are using analysis from business intelligence now that they have gained the ability to evaluate groups of metrics together, such as quality scores and financial performance, to support the company’s growth. Home to more than 17,000 creatures, the National Aquarium also acts as an educational resource and a leading force for environmental conservation along the Eastern Seaboard. Changing the way HR had operated for many years was not easy for the National Aquarium, but company executives knew that greater HCM results would emerge by removing as many tactical activities as possible, moving processes online for more proficiency, and leveraging strategic business intelligence. That jump to a more strategic HCM came about in 2009 when National Aquarium opted for a new cloud-based solution which empowered them to control expenses, transform its HR operations, and reduce risk related to compliance and litigation. “My team can quickly and correctly address compliance needs and challenges. Workplace regulations are becoming more complex, but a leading people management solution makes it easy for our team,” said Candace Osunsade, HR executive for the National Aquarium. With reliable, centralized, and secure information, as well as instant, configurable reporting, the HR team is well-positioned to reduce risk and vulnerability to legal issues and noncompliance. To get a seat within the executive circle, Osunsade recommends HR practitioners leverage technology to automate processes, convert workforce metrics into business results, and establish credibility as corporate strategists. She also believes in the power of relationships with her HCM provider. “To prosper in today’s business environment, HR executives must focus on finding and trusting the right HCM business partner,” said Osunsade. Concord Hospitality Enterprises is a hotel owner and developer operating under brands such as Marriott, Hyatt, and Hilton, with 90 hotels and more than 4,000 associates in the United States and Canada. Formed in 1985, Concord properties have won several top honors for operating and development excellence. Previously, Concord Hospitality had 80 individual business units in the U.S. and Canada with different methods and processes for people management. After Debra Punke moved into the role of vice president of human resources, she realized she had an opportunity to deliver a range of business efficiencies and strengthen the company’s relationships with current and future associates. With the right HCM technology, Concord could increase associate engagement and productivity, and then add value to the overall business. Punke sought an integrated system for the U.S. and Canada that could manage the entire employee lifecycle, improve compliance, and enhance Concord’s business intelligence and reporting capability across the enterprise. Once they begin employment, Concord’s thousands of associates in North America rely on their HCM solution to access their personal HR information and to initiate changes to their selections for benefits, direct deposit, beneficiaries, and more. Automated task notification with built-in reminders ensures a documented, auditable process—eliminating the need for HR to track down colleagues and vendors to confirm that the right provisioning has been set up for the new hire. Senior leaders at Concord sought to determine the total cost savings from using the HCM solution, including direct costs, productivity gains, and improved efficiencies. “After three years of using a leading cloud-based HCM solution, we recorded $800,000 in savings, with the majority coming from hard costs and boosts in productivity,” said Punke. Organizations in the hospitality sphere are uniquely poised to take advantage of the tools offered by comprehensive people management. A best-in-class solution can help tackle seasonal turnover and fluctuating staffing requirements while streamlining day-to-day operations. No matter how many locations you have or guests you serve, cloud-based HCM helps your people work smarter. People management offered in the cloud empowers employees and managers to access their data from anywhere. Streamlined online workflows can make filling vacancies with top talent easier than ever. Dozens of disparate sources of information can be consolidated into one single system-of-record for your entire organization. And automation of archaic tasks can help you reclaim hours lost to administrative processes, reduce paper waste, and attain significant savings over time. More than 4,100 organizations have selected UltiPro as their payroll and HR software of choice. With a proven history of streamlining payroll and human resource processes for the hospitality industry, UltiPro can help companies, whether they are looking to remain compliant or stay on top of their payroll requirements while keeping efficiencies high. 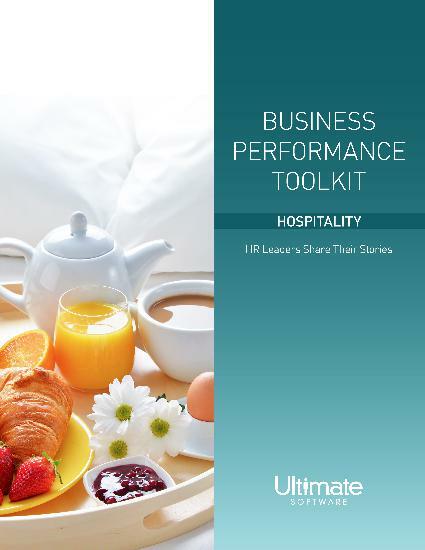 To learn more, watch a brief overview tour and click here to download the Business Performance Toolkit Whitepaper for the Hospitality Industry. Please fill out this brief form to access your hospitality toolkit.